Spend four days in the charming mountain town of Steamboat Springs, Colorado, in the company of professional musicians, authors, artists, and photographers. You will be a part of an intimate group of enthusiastic individuals who want to write, paint, develop their photography skills, play chamber music, or sing in vocal ensembles. Or you may choose simply to be in this creative atmosphere to renew your mind and spirit as you watch and listen. 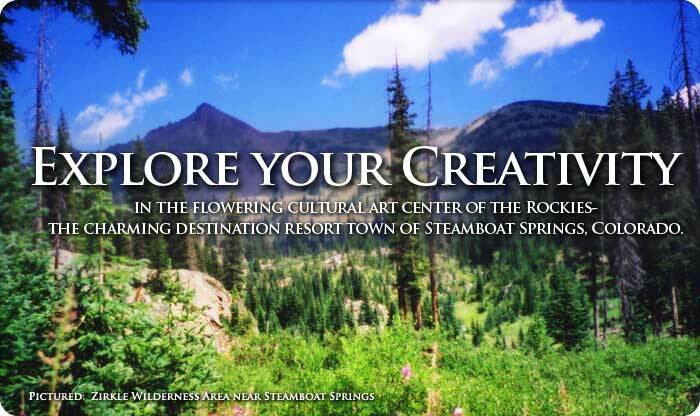 Arts for the Soul's weekend session is part of Steamboat Spring's ALL ARTS FESTIVAL. Our workshops begin on Thursday August 20th and run through Sunday August 23rd 2009. You can sign up for all four days of a workshop or for single days. The workshops fill up fast and we suggest early registration. Arts for the Soul is directed by John Sant'Ambrogio, Principal Cello of the St. Louis Symphony Orchestra for thirty-seven years (1968-2005). 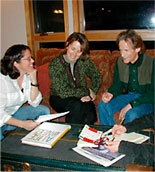 Classes can be very relaxed and informal. Explore the creative writing process, sketch the glorious Colorado Rocky Mountains, improve your nature photography, learn a new instrumental technique, or deepen your understanding of a favorite composer. Nourish your creativity and experience a spiritual uplift under the tutelage of professional musicians, writers and artists. Everyone, from novice to master, is encouraged to broaden their experience and have fun while doing it. Enthusiasm is the most important requirement. Even if you have never lifted a paintbrush or stroked a violin in your life, you will feel comfortable as a first-timer at Arts for the Soul. A Full Experience After your creative writing class or art workshop, for example, you can sit by a Colorado mountain stream or stroll through the lovely aspens in the beautiful countyside. Visit the shops and galleries along historic Main Street in Steamboat Springs, or soak in Steamboat's famous hot springs and then receive a relaxing massage. Spend three evenings dining with your new companions at one of the many outstanding restaurants in Steamboat Springs. 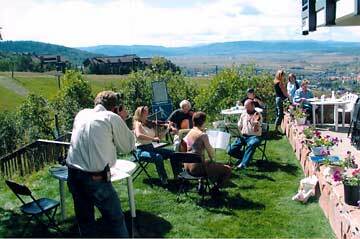 Suppers on the other evenings are on our patios, where you can enjoy spectacular Rocky Mountain sunsets. During dessert, enjoy a music event, an art demonstration, or a fascinating panel discussion on the creative process. Just imagine being able to listen to chamber music every day with world-class musicians on cello, violin and viola! You may then end your day in our spa's hot tub or curled up in front of a fire back at your comfortable condominium. If your friend or companion doesn't care to participate in our art workshops, he or she may join you at a reduced rate. Few places in our country can rival the summer outdoor activities - golf, tennis, fly fishing, biking, boating, swimming, and hiking - available in Steamboat Springs and the surrounding Colorado mountain countryside. Page delivered in 0.00043 seconds.